An algorithmic penalty is one of the worst fates a marketer can face, but one Brafton customer proves this can be a temporary setback when handled correctly. The company, a B2B IT solutions provider, demonstrated telltale signs of a Penguin penalty just after the refreshed algorithm was released in October 2013. Whereas the customer’s website had previously seen healthy traffic, visits dropped dramatically (from thousands to a couple hundred a week) and stalled after the algorithm was released. Before the client could fix the problem, it first needed to make sure the site’s devaluation was indeed the results of a Penguin penalty. After careful analysis, it compiled a list of backlinks that were to blame. This is where the hard work comes in. Penguin recovery requires that website owners go into the backends of their pages and remove any links that might set off a red flag with Google for being spammy, such as those purchased or acquired in another kind of link scheme. Brafton’s content marketing strategists worked with the client to disavow the links identified as the references impacted by Penguin. After disavowing or no-following links, webmasters must submit a reconsideration request to Google. If the problem is not completely cleared, Google will send a denial message. By March 2014, visits increased 10 percent and new visits had surged 16 percent year-over-year. Fortunately, the company had taken care of the link issue because its traffic started to rebound after a few months. By January 2014, the site’s traffic was on the upswing, and a couple hundred weekly visitors steadily turned into several hundred and eventually climbed up to thousands. By March, the customer was receiving more website visitors year over year than it did prior the Penguin hit. Visits increased 10 percent, comparing data for March 2014 with figures from March 2013, and new visits had surged 16 percent year-over-year. 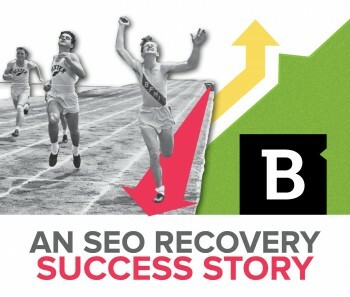 As further evidence of the recovery, the company also saw its on-site metrics improve – visit duration increased 12 percent, suggesting Google was again making it easy for qualified prospects to find the site and read its blog content. This example goes to show that algorithmic penalties don’t have to be the end-all of a company’s search rankings, assuming they are willing to do the work to recover.